Another bug in My NCBI? This bug is now fixed (15-11-2008) !!! 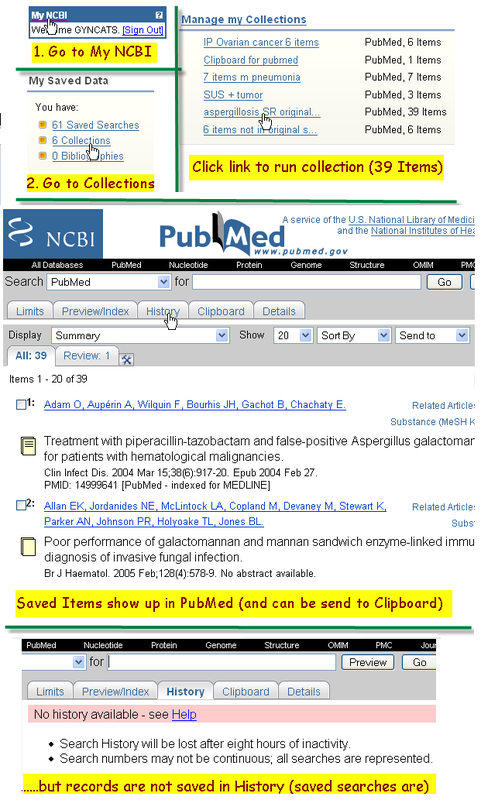 October 15: another bug appears to be reintroduced: you can save relevant records in My Collections to run them later in PubMed. However, although the search is executed, it does not appear in the Search History. For me this is an essential feature of My Collections.Often, when I develop a sensitive search, I collect all relevant studies, especially the ones that were not in my search (i.e. found by checking references or ‘related articles’). Then I optimize the search and hope all the relevant records will be found. This can be checked by combining (a) search(es) with the collection(s). If the search is good all relevant records will be found. Of course this will only work when you CAN combine the collection from My NCBI with one or more searches in the History. A cumbersome solution, that only works for one collection at the time, is that you send the collections (executed in PubMed) to the Clipboard and combine this set (#0) with the searches, but I prefer a simpler solution. In fact it has always been possible in the past…. Well we will write again to the help desk. Hopefully I will report the bug repair next week and there will be no follow up. Voor de tweede keer een bug in My NCBI. Dit keer gaat het om “My Collections”. Als je een “collection” activeert, worden de desbetreffende records (in het voorbeeld 39 items) wel uitgevoerd in PubMed, maar komen ze niet in de History terecht. Dat vind ik erg vervelend, omdat ik My Collections vooral gebruik om uitgebreide zoekacties op te zetten. Ik sla alle relevante artikelen op in My Collections en voer ze op een later tijdstip uit. Dan combineer ik ze met een of meer searches. Ik kan zo checken of ik met zo’n search alle relevante artikelen (bijv. gekregen van klant of via related articles) vind. Is dat niet het geval, dan is het een manier om ontbrekende termen te vinden. Deze procedure werkt nu dus niet meer, omdat een set uit My Collections niet in de History terechtkomt. Ik heb wel een voorlopige kunstgreep bedacht, t.w. deze items in Pubmed naar het Clipboard sturen, zodat ze alsnog als set #0 in de History komen te staan. Dat werkt natuurlijk maar met 1 set tegelijk en is tamelijk omslachtig. Voorheen werkte dit trouwens wel altijd, dus het zal wel weer liggen aan de overhaaste ‘reparaties’ en aanpassingen. Nou, dat wordt weer een mailtje richting helpdesk. Hopelijk wordt het snel verholpen en hoort u even niet meer van mij..
I’m pleased to announce that the bug in PubMed’s My NCBI, that I pointed out a week ago, has been repaired. “You can now save searches with search statement (aka History) numbers. Unfortunately, any that you recently created that didn’t work are not going to work, so please delete those. 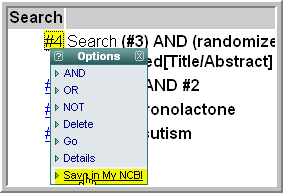 As part of the fix, we made some changes to how links for saved search names work in My NCBI. On the screen where you used to see “View Results,” use the search name to link to run the search in PubMed. The “Edit” link now takes you to where you can change the specs of the search. These changes are not yet finished. When we have things running normally we will provide more detailed information in our newsletter. I’ve checked it and it really works. Thank god it does. It is really an essential feature, especially for the unexperienced searcher: the (correct number of) brackets are automatically in the right positions. I’m also pleased with the way the saved searched are presented. It is far more logic that the search is executed when clicking at the underlined name (which looks like a link) and that you can edit where it says “edit”. I’m looking forward to the other enhancements. The PubMed My NCBI feature has been updated. The navigation is entirely different and -in my view- less intuitive and more complex. The increased complexity may relate to the new features, some seeming rather unnecessary (filters), others looking promising: my bibliography, persistent cookies, no limit to the number of saved searches or collections per account (hurray!). You can find details about the My NCBI changes in the NLM-bulletin and in MyNCBI-help. For now, I just want to address one point, that hopefully is a “temporary error”. I noticed it last Friday, thought that it was just a technical error of the kind that frequently occurs these days in PubMed, but will be restored without any notice. Before, if you combined two sets, say: “#1 AND #2”, set #3 would be created: #1 AND #2. If you would save #3 in My NCBI, you would save the entire search behind #1 AND #2, but now only the string “#1 AND #2” is saved. You can easily imagine that set numbers #1 AND #2 are only meaningful if #1 AND #2 are still present and the same as in the original search. A Dutch colleague just shouted out he got an error message when trying to execute a saved search. Set X was not recognized…. Suppose you want to find an answer to the following question: Is spironolactone useful (compared to cyproterone acetate for instance) to reduce hirsutism in women with PCOS? combine the two sets with AND. Subsequently combine #3 with a narrow filter for the Therapy Domain (filter for RCT’s) in the Clinical Queries. Set #4 (=#3 AND filter) gives 23 results. You save set #4 in My NCBI. It is saved as #3 AND filter, not as: hirsutism AND spironolactone AND filter. Reexecuting the search if the original History is gone yields 0 results (or an erroneous result). Personally I can circumvent most problems, because I optimize my searches in Word (also nice as safeguard when the PubMed servers are overheated), but for most users this is an unnecessary extra step. I hope this bug (?, I hope it is a bug) is quickly restored by NLM. Please inform them by writing to the PubMed helpdesk (at the bottom of the PubMed front page). I will do the same. PubMed Search Clinic on ATM, Citation Sensor, Advanced Search: Video available. The video from the online Search clinic on recent PubMed changes, announced in a previous post is now available at: nlm.nih.gov (pmupdate08): click here. A good coverage is given by Michelle Kraft (Krafty Librarian) at her site (click here). The clinic, presented by Katherine Majewski, updated recent changes to PubMed, earlier described at the NLM information bulletins on the new ATM and the Beta Advanced Search page. Recent changes have also been amply described (and discussed) at several of my previous posts, most notably this one. Here is an overview, with emphasis on new aspects (at least to me). In the clinic the citation sensor was defined as: “a new feature designed for users seeking specific citations”. However it is not a separate search box. The citation sensor works automatically when you type words into the general search bar. If combination of words are recognized as representing citations (e.g. 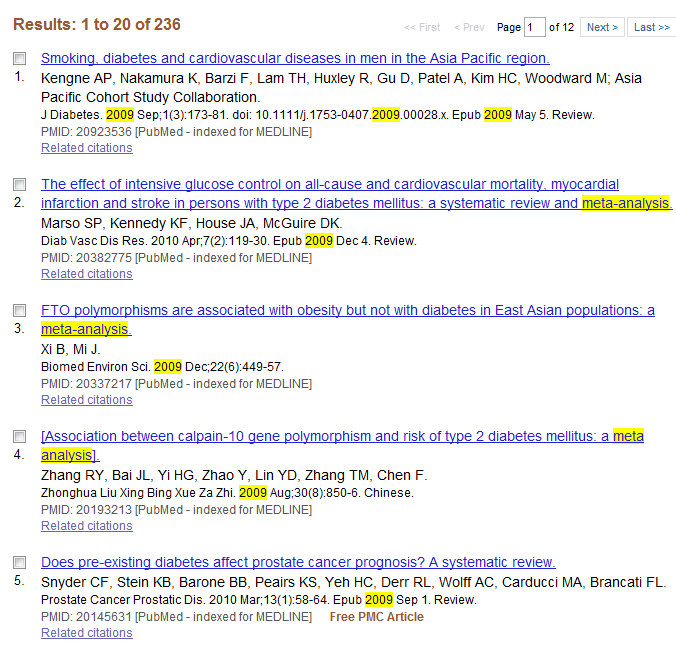 volume numbers, author names, journal titles) the matches are displayed in a yellow box above the retrieval. In my previous post I already discussed that the sensor doesn’t always work perfectly and like Krafty, I think that the Single Citation Matcher (in the blue side bar) performs better. It suggests author and journal titles as you write them. Furthermore, you can just fill in the specific information you know in specific fields, i.e. if the author name is misspelled/wrong, it often suffices to fill in year, page number and title word(s), to name just one possible combination. In response to a question, Majewski said the sensor is not an advantage per se as opposed to the Single Citation Matcher. 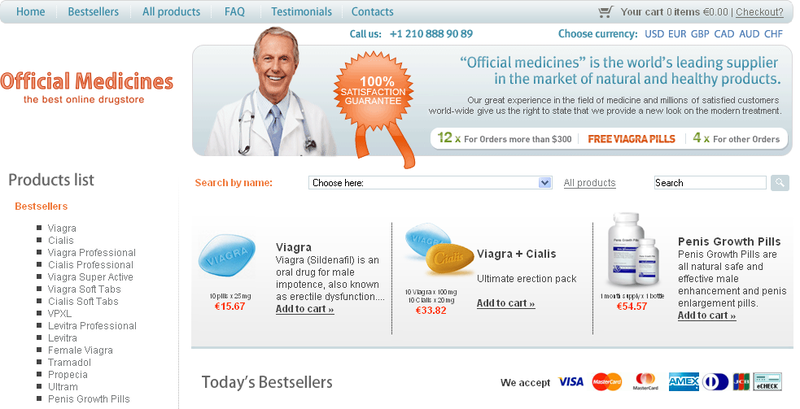 Probably it is just handy for people used to a Google-like way of searching. One thing new to me was that there are two “Details” when performing a search. 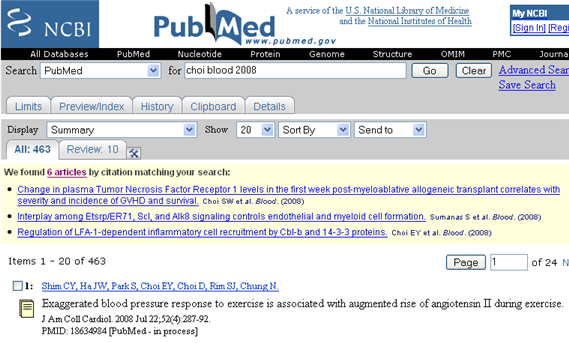 When you type: choi blood 2008, the citation sensor finds 6 hits, 3 of them shown in the yellow box. The Details button shows: choi[All Fields] AND (“blood”[Subheading] OR “blood”[All Fields] OR “blood”[MeSH Terms]) AND 2008[All Fields]. Thus in fact the search is translated twice (although the citation sensor-results are always a subset of the full results). If you click on 6 articles, the 2nd translation appears as a 2nd search in the Search History. ATM – Automatic Term Mapping. ATM has been changed in conjunction with the citation sensor in order to identify queries that contain citation-type information. The old ATM mapped search terms to subject, journal, and author tables in that order. 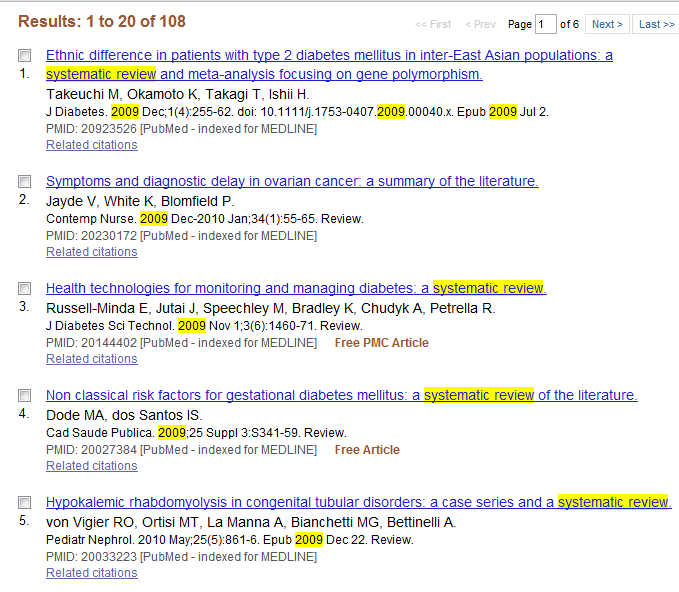 If a MeSH-match was found, PubMed would search for that MeSH as well the user-input as a textword (title, abstract). Automatic term mapping would then stop because it found a match with MeSH. Thus terms that are not only in the MeSH but also in the author or journal table would have been missed, such as in Burns Laryngoscope 2005. The old ATM would map Burns and Laryngoscope as MeSH (subject-search), but the new ATM also searches these terms in ‘all fields’, thus enabling the retrieval of the paper of Burns in Laryngoscope. In the Q & A part of the session Majewski advised to use qualifiers as MeSH when Burns is searched just as a topic. I only wonder if/how most of the untrained people would find this out. Statistics, however, show that the thousands (‘real’) queries performed returned only 10% extra hits on average (see ATM-FAQ for more information). According to NLM, the enhanced ATM and citation sensor have considerably improved searching PubMed. Probably because most people just come to PubMed to search a specific paper or subject (running one or two search commands). The new features enhance citation searches, while subject searches do not suffer too much as long as multiple terms (concepts) are used, as this will filter much of the noise seen with one term (because the term is searched within the context of the other word). My remark that most of my patrons do do subject searches was interpreted as “do do broad searches“. Which in effect they do (i.e. searches for systematic reviews), but I do not think the suggested NCBI books might be very helpful to them, although it might indeed serve those people (patients?) that want information about broad subjects like “burns”. 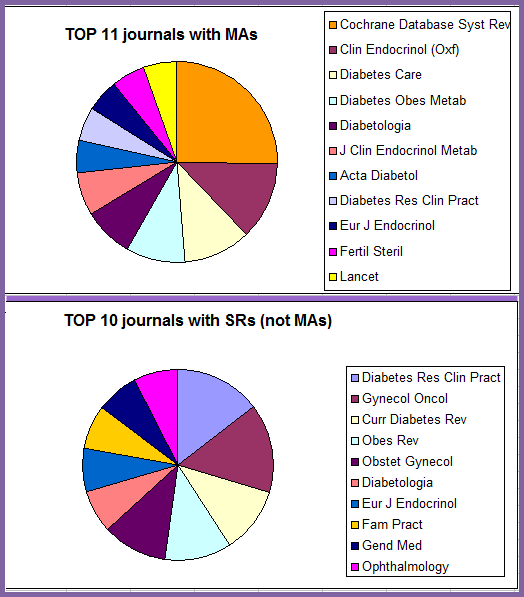 Perhaps PubMed/NCBI can offer subject searchers other tools as well. 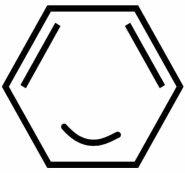 Substance names (such as ferrous glucanate) and MeSH with stand alone letters or numbers (like complement factor B) will not be broken apart, but searched as a phrase. 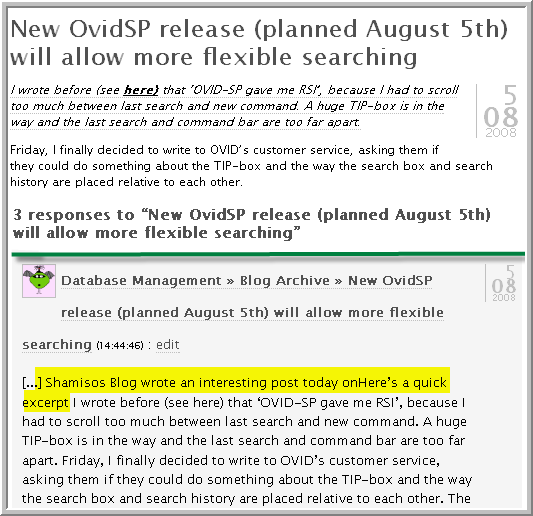 Advanced Search is amply discussed in a previous post. However, I didn’t mention that the page consists of 4 collapsible boxes beneath the Search Bar (I missed this: you have to click a small minus sign at the upper left of each box in order to collapse.) In essence you can search by many fields, the default fields displayed being Author, Journal, and Publication Date (box2) and all fields (box 4). There is an index for each selected field available (little buttons right of the search boxes). I see no other difference between box 2 and 4 than the defaulted field and the fact that you can only make multiple choices from the index in box 4. Answering a question in the audience Majewski said they might consider allowing multiple choices in box 2 as well. Box 3 shows limit-options, much the same as the Limit-tab in the usual frontpage, except that you can unlock your limits to future searches using the lock icon (by defaulted limits are carried to future searches). 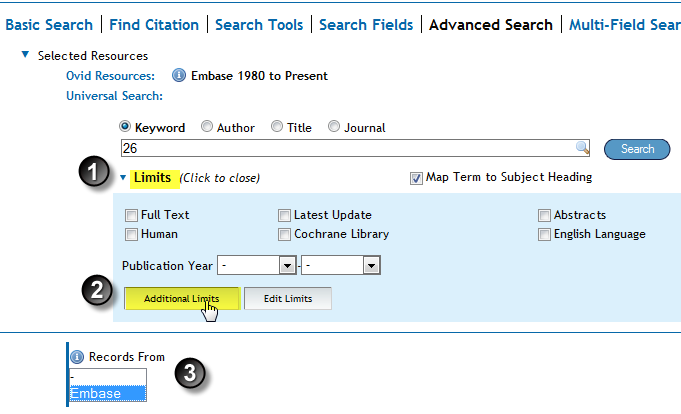 Thus again this new ‘enhancement’ mainly facilitates citation searches, not subject searches. Clinical Queries are absent and it is for instance not possible to look up any MeSH other than by index, and even this often goes wrong with multi-word terms. The question why MeSH-trees were unavailable in the beta-version remained unanswered at the clinic. It was a relief though to hear that there were no intentions to replace the normal PubMed frontpage by this advanced search page in due course. Katherine Majewski ended the clinic by saying that answers to the questions posed during the clinic would be shown at this NLM-page later. She also encouraged to give positive and negative feecback by writing to the NLM customer service and to be as specific as possible if your search was negatively affected by the recent PubMed changes. De video van de PubMed Search Clinic, die ik in een eerder bericht aankondigde is nu te zien op: http://www.nlm.nih.gov/bsd/disted/clinics/pmupdate08.html. 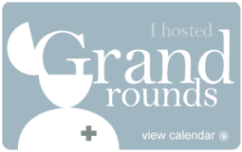 Michelle Kraft (Krafty Librarian) heeft de clinic al goed op haar blog samengevat. Eerder heb ik deze veranderingen ook al uitgebreid beschreven en becommentarieerd. (zie bijv. hier). In de webpresentatie werd de “citation sensor” omschreven als: “a new feature designed for users seeking specific citations”. Het is echter geen aparte zoekoptie. De citation sensor doet zijn werk automatisch als je woorden in de algemene zoekbalk typt. De als citaties herkende hits worden apart op een gele achtergrond getoond. Eerder heb ik al opgemerkt dat de sensor niet altijd goed werkt en evenals Krafty denk ik dat de Single Citation Matcher (in the blauwe balk) veel beter werkt. Deze geeft nl. woordsuggesties terwijl je typt en je kunt elke mogelijke informatie specifiek invullen. Weet je een auteur niet dan kun je vaak volstaan met jaar, paginanummer en titelwoorden, om maar één combinatie te noemen. Volgens Majewski is de sensor ook niet perse beter. Waarschijnlijk is het vooral handig voor mensen die gewend zijn aan een Google-zoekwijze en die verder weinig weten van PubMed. Zelf zou ik toch wel graag willen dat je de citation sensor naar believen aan of uit kon zetten. Ik zag nu pas voor het eerst dat je 2 “Details” hebt, als de citatie-sensor iets mapt. Typ je: choi blood 2008, dan vindt de sensor 6 hits en toont er 3. Onder Details is te zien dat Pubmed de search vertaald als: choi[All Fields] AND (“blood”[Subheading] OR “blood”[All Fields] OR “blood”[MeSH Terms]) AND 2008[All Fields]. Dus, er zijn eigenlijk 2 ‘vertaalslagen’ Als je op 6 articles klikt dan verschijnt de 2e mapping als een zoekset in the zoekgeschiedenis. ATM is evenals de citatie-sensor ontwikkeld aangepast om zoekacties gericht op het vinden van artikelen te vergemakkelijken. De oude ATM stopte met het zoeken van termen in de MeSH-, auteurs- en tijdschriftenlijst als een passende MeSH was gevonden. Tevens werd het ingetypte woord als tekstwoord gezocht. Met als gevolg dat termen die zowel in de MeSH- als in de auteurs- of tijdschriftenlijst voorkwamen nooit anders dan als MeSH (en tekstwoord) werden gezocht. Met Burns Laryngoscope 2005 zou dus nooit het artikel van Burns in Laryngoscope zijn gevonden. Met de nieuwe ATM lukt dat wel. Majewski adviseerde om veldenaanduidingen (qualifiers). zoals MeSH te gebruikenals je op een onder onderwerp zoals ‘Burns’ wilt zoeken. Dan vraag je je wel af in hoeverre de gemiddelde Pubmed -gebruiker dit weet. Tijdens de sessie werd niet echt aangekaart dat termen die uit meerdere woorden bestaan worden opgesplitst en in alle velden worden gezocht. Eerder heb ik al laten zien dat bij de nieuwe ATM 2,5 x meer hits oplevert met een term als gen therapie en dat de meeste van deze hits weinig relevant zijn. Volgens de NLM statistieken leiden echte zoekacties gemiddels slechts to 10% extra hits (zie ATM-FAQ voor meer info) en zijn zoekacties door de vernieuwingen aanzienlijk verbeterd . Waarschijnlijk omdat de meeste mensen alleen maar snel even iets opzoeken (1-2 zoekopdrachten) en vooral geinteresseerd zijn in specifieke artikelen. Wat dat levert het intypen van wat termen in de zoekbalk nu eerder wat op, en zolang je veel termen met elkaar combineert heb ik ook niet veel last van veel ruis bij het zoeken op onderwerp. Maar ik ben zeker niet overtuigd dat dit het zoeken op onderwerp verbetert. Mijn opmerking dat mijn klanten vooral op onderwerp zoeken werd opgevat als dat ze vooral breed zoeken. Nu is dat wel zo, maar ik denk niet dat zij veel aan suggesties hebben als NCBI-books. Dit lijkt me wel geschikt voor mensen die zich globaal willen inlezen in een onderwerp als brandwonden (burns), patienten bijvoorbeeld. Misschien heeft PubMed/NCBI wel nog andere tools voor uitputtende searches in het verschiet…. Substance names (zoals ferrous glucanate) en MeSH with losstaande letters en cijfers worden niet langer opgesplitst, maar als phrase gezocht. Advanced Search heb ik ook eerder uitgebreid besproken (zie hier). Wat ik nu pas bemerk, is dat de velden onder de zoekregel in-en uitklapbaar zijn. Er is een miniscuul min tekentje helemaal linksboven elk veld, waar je op moet klikken om het veld te verkleinen. De essentie van advanced search is dat je veel verschillende velden kunt doorzoeken, maar dat de standaard velden weer citatie-gericht zijn, dus: Author, Journal, and Publication Date (veld 2) en All Fields (veld 4). Je kunt termen voor elk gekozen veld opzoeken in een index (klein knopje rechts). Ik zie eigenlijk geen verschil tussen veld 2 en 4, behalve dan het standaard veld en het feit dat je in het 4e veld verschillende termen tegelijk kunt aanklikken. Mogelijk komt deze optie ook voor veld 2. In veld 3 kun je limieten aanklikken, eigenlijk erg vergelijkbaar met de Limit-Tab op de PubMed openingspagina. Wel prettig dat je een limiet desgewenst alleen gedurende één zoekactie kunt toepassen (default: blijft alle zoekacties aanstaan). Dus ook advanced search beta is vooral ten dienste van degene die bepaalde artikelen zoekt. Je kunt bijvoorbeeld alleen maar de MeSH in de index opzoeken en er zijn geen Clinical Queries. De vraag waarom De MeSH-hierarchie niet geraagdpleegd kon worden vanuit bleef onbeantwoord. Het was wel een pak van mijn hart, dat het volgens Majewski niet de bedoeling was dat de Advanced Search de normale openingspagina op termijn zou vervangen. Katherine Majewski beeindigde de sessie met de mededeling dat antwoorden op gestelde vragen later op deze pagina zou verschijnen. Ze verzocht iedereen ook hun eventuele problemen met de veranderingen zo specifiek mogelijk aan de help desk door te geven. PubMed Online Search Clinic on ATM! Just a short note at the last moment. Back from vacation I picked up some twitter and blog messages announcing a PubMed search clinic offered at July 17 (today!) at 2pm Eastern time (8pm Amsterdam/Paris time, see timetable throughout the world). A 30 minute online search clinic will be presented by the NLM® and the National Training Center and Clearinghouse (NTCC) via Adobe® ConnectTM on Thursday, July 17th (2pm ET). The presentation will cover changes to PubMed including changes to how PubMed handles your search (the new automatic term mapping process), the citation sensor, and the beta Advanced Search page. There is a maximum capacity of 300 participants, on a first come first served base. However, the clinic will be recorded and will be available for viewing later. Here you find more info about the clinic, as well as tips for successful participation in the clinic. Be sure to test it beforehand. The Krafty Librarian: @Krafty (twitter) and several posts on her blog. Net terug van vakantie zag ik enkele twitters en blogberichten die een “PubMed search clinic” aankondigden. Deze begint om 8 hr p.m. (welke tijd waar?). Het duurt 30 minuten en gaat over de recente veranderingen in Pubmed, de nieuwe ATM (automatic term mapping), de citation sensor en Advanced Search Beta. Er kunnen 300 mensen deelnemen, volgens het “wie het eerst komt, het eerst maalt” principe. De clinic wordt wel opgenomen, zodat je hem later nog eens kunt bekijken. Inclusief tips om de clinic goed te kunnen volgen. The Krafty Librarian: @Krafty (twitter) en verschillende blogberichten. 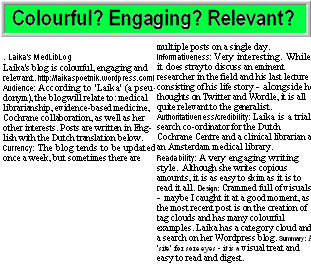 Nikki (Eagledawgs) te gast op het blog van David Rothman. Achtergrondinfo over wat anderen van de veranderingen vinden zijn ook te vinden de site van Krafty Librarian (zie hier). 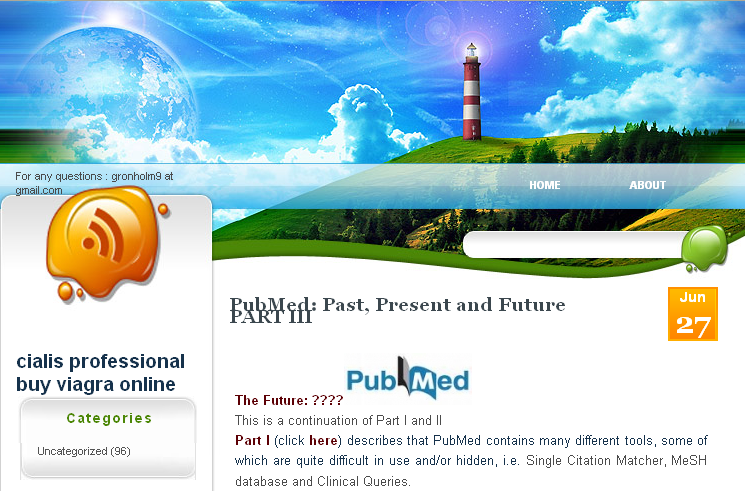 Enkele van mijn eerdere berichten zoals PubMed: Past, Present And Future, PART II zijn er ook aan gewijd.